NEStalgia is an original multiplayer RPG inspired by the glory days of traditional console RPGs. 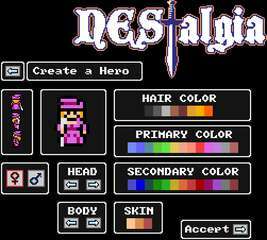 Essentially "Dragon Warrior 3 meets World of Warcraft", NEStalgia is an amalgam of the best generations of RPG gaming. NEStalgia can be played locally in single player mode or in small private games with friends. Where the game really shines, however, is on larger dedicated servers with 50+ online players. On dedicated servers you can test your might in NEStalgia's balanced and competitive PvP battles, or get 8-bit rich by selling rare loot on the player auction house. If you're looking to make new friends to adventure with then you can always join or create a custom guild. In order to tackle NEStalgia's difficult end-game content you're going to need every bit of help that you can get. NEStalgia is constantly evolving and expanding, ensuring that players will constantly have new updates to look forward to. Purchasing NEStalgia guarantees full access to all future updates and content expansions at no additional charge.